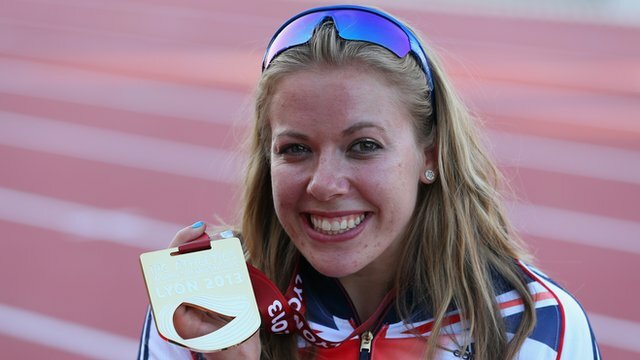 Paralympic champion Hannah Cockroft retained her T34 200m title in dominant style at the IPC World Athletics Championships in Lyon. The 20-year-old, who won by almost two seconds, was one of three Great Britain medallists on the opening day. Aled Davies, 22, set a new world record to win the F42 shot put with a best of 14.71m – beating the old mark of 14.43. Jonathan Broom-Edwards, who was only classified for Paralympic competition in June, won F42/44 high jump silver. Cockroft, whose best this season was almost four seconds faster than her rivals, was never troubled. She was well clear after 100m and went on to win in 31.76 seconds, with Australia’s Rosemary Little second (33.73) and Amy Siemons of the Netherlands third (34.54). “My goal was to go out and retain the title and I’ve done that,” Cockroft told BBC Sport. “It was really hot out there and the track wasn’t the fastest in the world. I’m still happy, although I hoped I would get a better time than I did. Cockroft will be back in action on Monday in the 100m final but, despite her dominance in the event, still feels nervous. Davies, who on Monday will compete in the discus, in which he won Olympic gold last year, was also delighted to have secured the first part of a potential double in Lyon. “I knew coming out here what I was capable of doing and I had a massive throw in the tank,” the Welshman said. “It was a metre further than I threw in London – not bad for my weaker event. Keen basketball player Broom-Edwards was only an occasional high jumper until he was fast-tracked into the Paralympic programme four months ago after realising his talipes (club foot) could make him eligible. Now training under national coach Fuzz Ahmed at Loughborough, he said winning a medal in his first major international competition was “fantastic”. Broom-Edwards, whose jump of 2.08m was a personal best, added: “I came out here for a medal and the atmosphere gave me the push I needed but I definitely have more in me. Elsewhere, Welshman Nathan Stephens lost his javelin title,finishing fifth with a season’s best 39.87m throw. Scot Libby Clegg safely reached her T12 200m final while Northern Irishman Jason Smyth, competing for Ireland, was the fastest qualifier in his T13 200m heat. But although teenager Jade Jones reached the final of the T54 5,000m, compatriot Shelly Woods, who later admitted she was feeling unwell, finished well down the field after being lapped by the leading contenders early in the race.